Beautiful DeliciousAlba is perfect from head to toes. Her fans are ready to give up everything for a private show with this bombshell. Her delightful blonde hair and delicious body won't leave anyone indifferent. Hurry, DeliciousAlba is already waiting for you in her chat-room! Dear models, we can't wait to see you in the first place! Be bold and daring, and you will become the best next Monday! 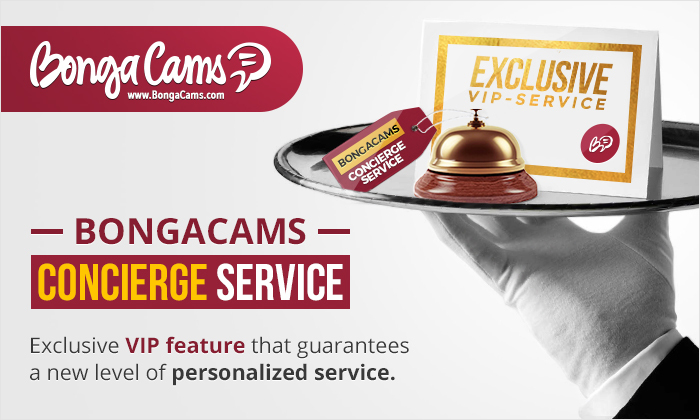 We are proud to introduce BongaCams concierge service - an exclusive VIP feature that guarantees a new level of personalized service. BongaCams concierge service is a special kind of support (can be compared to a personal secretary) that guarantees individual approach and priority service in any situation. A concierge service specialist will be extremely quick to help you solve any issue, make sure you always have exclusive offers and unprecedented opportunities right when you need them. Any issues sorted out in no time, immediate deposits, refunds, ideas and suggestions - all that is now possible to handle quicker than you could imagine was possible. KandyKitten – the most vivid model of BongaCams! This pink-haired beauty is famous for her amazing shows – a real extravaganza! Visit this saucy minx's room right now to get to know her better! Her yummy body and cheeky style will surely impress you! Dear models, don't be afraid to show your individuality! Flirt, tease and make jokes and you will become the next winner! This season’s largest sale - BLACK FRIDAY AND CYBER MONDAY 2017 on BONGACAMS! We continue to follow the hottest shows on BongaCams! Today we can't wait to congratulate amazing hettinger for winning first place in “International top-100” contest! Visit her chat-room and greet this dazzling beauty!